One of the reasons why I prefer Anonymous. He's a bit like Michael Moore. Any time someone becomes "the face of..." whatever, you can be assured that they'll quickly come to favour the sound of their own voice and the public promotion of themselves over whatever cause, however worthy, they were originally about. A little twist on the iron law of institutions. Assange is far, far worse than Moore. The worst Moore's ever done in my book was to support Ralph Nadar. Michael Moore warned of Trump's rise and that Hilary Clinton wasn't cutting it to challenge it. Assange is paid up member of the 'drain the swamp' alt-right populists. He's yet another example of how a little knowledge is a dangerous thing and a twisted narcissist crackpot just like Trump. I should clarify, what I meant was that Assange, whatever originally motivated him, is now only really interested in self-publicity. As for the comparison with Moore, what I meant was that Moore went from a left wing documentary maker and investigative journalist to Michael Moore the brand. Both hit a point where it became all about them. So he's had his bid to have his arrest warrant overturned. Can't say that's too big a surprise. Wow, he gets properly stuck in. She's married to an Ex Tory who is apparently something to do with Friends of Israel, which appears to have sent the Assange faithful into some sort of apoplectic meltdown. 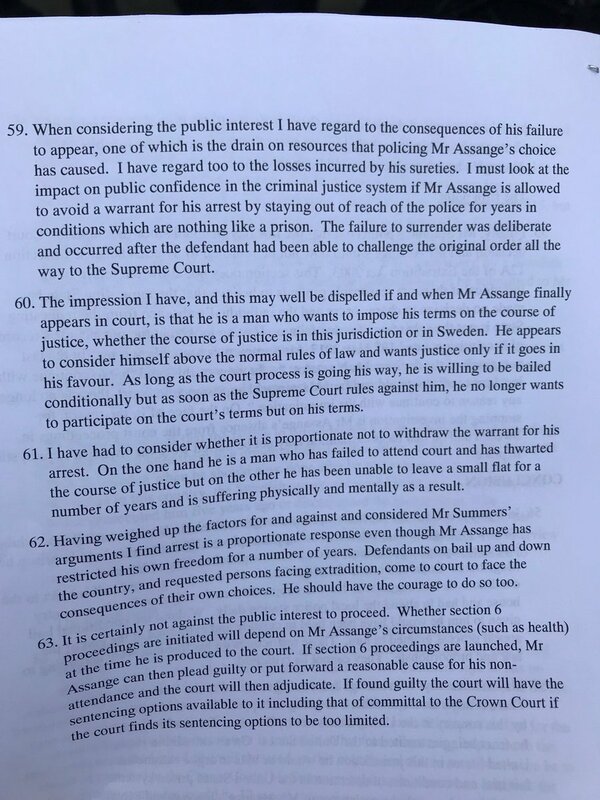 I'm very interested in hearing the point of law on which Assange fans are going to town. Remarkable. As another friend of mine put it, if someone accused me of violating his human rights while he was a guest in my house, he'd be getting marched through the door pronto, possibly with his hands tied behind his back. Reading between the lines they want him to stop his cat shitting on the floor.